OK, so once again I am a few days late in uploading the pictures of this system… I don’t know why it takes me so long to get around to uploading them from my camera… Fine – new resolution. I WILL download my pictures from the camera every day I take them…. Anyway, enough bemoaning of my techno-problems. Y’all want to to see how things are progressing in the system, right? Well here you go. As you can see in the pictures, things have been growing rampantly! 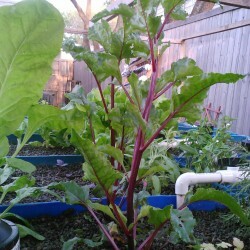 The Beets in Bed 1 are now over 2 feet tall and the Swiss Chard next to them is almost the same height and has leaves more than 6 inches wide! The Lettuce Mix in Bed 3 is averaging 9-10 inches in height — we will probably harvest that soon, temps are already reaching the mid to high 80’s… The Kale in Bed 5 is still booming, and this week the other three plants in the same bed are starting to show signs of rapid growth as well. Also in that bed, the Chocolate Cherry Tomato has six fruits currently and about 20 flowers in various stages of development. Harder to see in the slideshow are the peppers in Bed 8 — the Purple Bell pepper has its’ first fruit growing and the Hungarian Wax Pepper next to it has two! Finally, the three Cucumbers in Bed 10 are beginning to climb upwards (we actually put a trellis in after we took these pictures) and as of today (4/2) they are in full bloom with over 10 flowers between the three plants. And the biggest plant is only 7 inches tall! Hi! My name is Brandi Lane, my husband Daniel and I live in Tulsa, OK. We are just trying to start up a system indoors at our house. We love your ideas…we’re watching your progress. Great luck to you…. What do think about growing lettuce? We’re want to start with something that’s fairly hardy. And as far as fish, what do you think is the most tolerant species to start with? We’re just getting started and would love ANY advise you have for us.